In this super-sweet Spanish-English picture book of perspectives and opposites, a beyond-adorable little girl—with hair tied back and dressed for action and comfort in a plain white t-shirt, with purple shorts and sneakers and a matching backpack—traverses through a tropical jungle-like scenario, where she is compared to all the creatures she encounters. Domínguez’s art, which she begins with pencil sketches on illustration board, on top of which she glues tissue paper and then digitally adds layers of color, are in perfect partnership with the limited text. The book is elegantly designed, with mostly double-page spreads that contain lots of white space. Rather than the often-used, obnoxiously italicized Spanish words, here the English and Spanish are placed in different fonts that balance each other: the English in an unadorned black sans serif and the Spanish in a playful orange display font. The smooth repetition that begins each spread with a particular animal’s perspective of Marta in Spanish, followed by the English (with the adverb “very” inserted between duplicate adjectives, the happy result of which joins the two languages and slows down the reading), is rhythmic and natural—and at the same time, hilariously overdramatic. One of the final spreads, in which English predominates, “summarizes” the story in six mini-drawings that show how Marta and each animal are different. Another is a glossary in which the Spanish predominates. It’s headed by, in English, “Marta is” and “Marta meets.” And between these two is a spread in which our young protagonist is at home, in her own little “art studio” of sorts, with all that she needs to create her own story. A butterfly has landed on her finger, and she’s smiling widely. 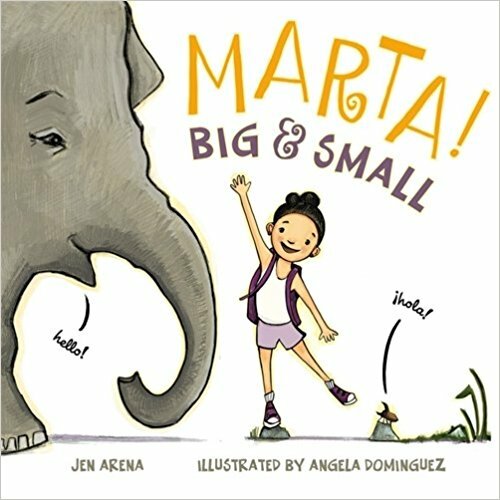 The balanced mix of Spanish and English here is delightful and unlike many picture books created for young children, Marta! Big & Small contains no explanatory text. It’s a fun read-aloud, perfect for bilingual classrooms of hablantes learning English and English-speakers learning Spanish—or, even better, in an environment where children are encouraged to call out a word or phrase they know or can intuit from the pictures. “Marta is una niña…an ordinary girl,” the story begins. And it ends with: “And clever, very clever, like una niña.” Indeed, there is nothing ordinary about this clever story, the art, or the use of language. Marta! Big & Small is highly, highly recommended.